Dies R Us: Ho! Ho! Ho! Hello Dies R Us Fans! Darlene here with you today sharing a card I've created for the upcoming holiday season. With all the fabulous dies available at our Dies R Us Store, (over 40 companies) you can create a fun card in no time at all (and use up some of those scraps while you are at it!). Do You Realize Christmas Day is exactly 4 months from today! If there is a particular theme die you're looking for, be sure to use the SEARCH feature at the store. For instance STARS ... it will show you all the star dies available from the various companies then just click on the one that catches your eye. I hope you'll come join in our bi monthly challenges at the Dies R Us Challenge Blog. A new theme begins on the 1st and 15th of each month and one lucky winner receives a gift voucher to the Dies R Us Store ... that could be YOU!! Thanks for stopping by! 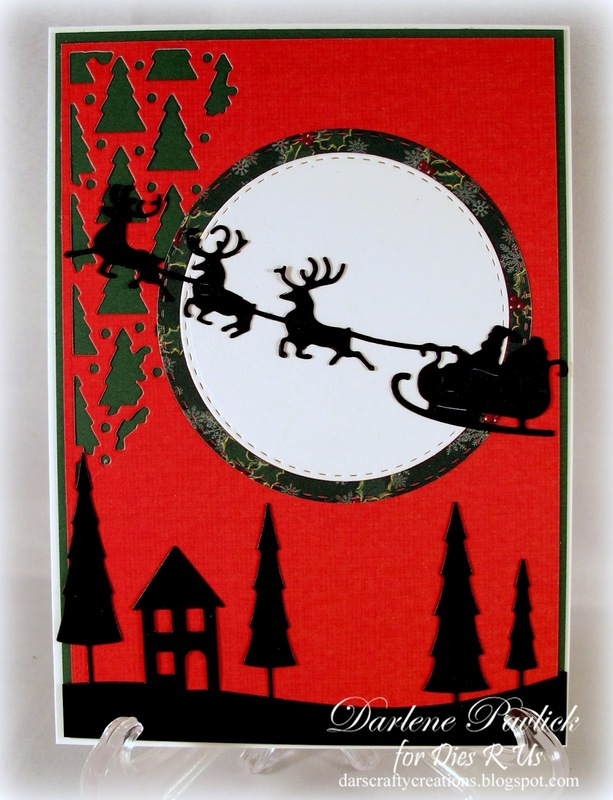 Sherri will be here tomorrow with another wonderfully inspiring die cut creation ... you won't want to miss it!! I'll be back with you again on Friday ... hope to see you then!